The "Ruins of sanctuary" base show the remains of a sacred building. Decorative bands contain Latin verses and some pieces of the wall are decorated with crosses. 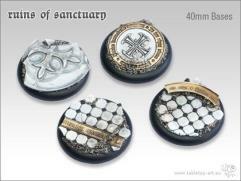 These are ideal for armies with clerical background, a brotherhood, paladins, priests or similar armies.